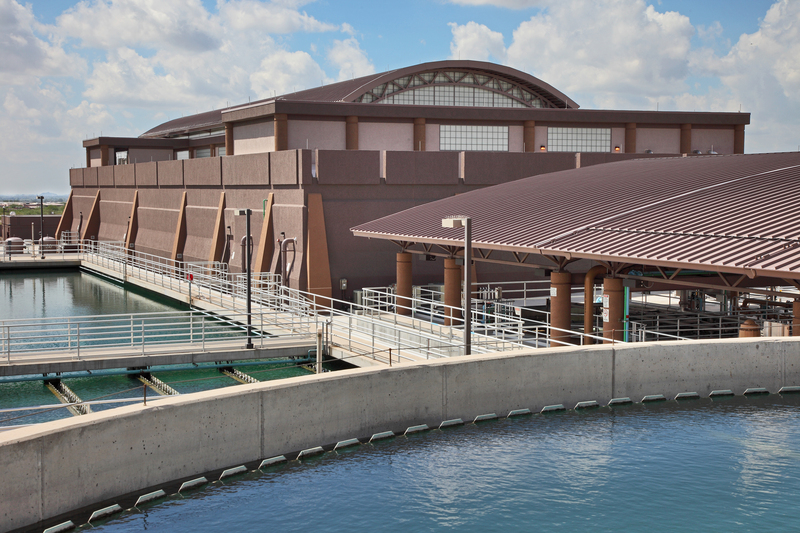 Archer Western was selected as construction manager at-risk for the City of Scottsdale’s CAP Water Treatment Plant Expansion project. The existing facility capacity provided 50 mgd of potable water for the northern region of Scottsdale. Construction of the new 20-mgd facility expansion was completed in four design packages and included a new 10-mgd finished underground concrete water reservoir, a new pretreatment complex, a dissolved air flotation facility for pre-membrane treatment, and a new 22-mgd microfiltration facility with associated CIP systems, chemical storage area, air scour equipment, and electrical equipment. This scope also included miles of large diameter pipelines to interconnect the existing and new facilities while maintaining flow to the plant that was accomplished with plant shut-downs and bypass piping. 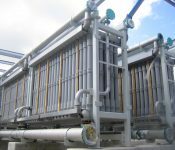 Flow meter vaults and valve stations made it possible to load the plant raw water feed without interruptions to maintain operations and to maximize plant process capacities during construction and after final completion. Archer Western worked in direct communication with the designer, Arcadis, on a daily basis to optimize the design and minimize project cost impacts. Both Archer Western and Arcadis had performed several previous projects with the City of Scottsdale and together built a level of trust with an open line of communication between all parties to move the project at a pace similar to a design-build project. Final original contract value for this scope of work was just over $78 million, with change orders awarded to add $13 million worth of new pump station electrical switchgear and controls, a new onsite chlorine generation facility to replace the gas chlorine disinfection system, and a new 100-ft diameter sludge thickening clarifier and related pump station. These additional scopes of work were completed through the same cooperative design and construction efforts by Archer Western and Arcadis. 1. 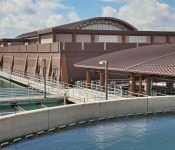 Arcadis had completed a design study report for the plant conditions and developed the most appropriate approach to improve the plant capacity and water quality in 2005. 2. Expansion of this facility would require staged construction so that early requirements could be met while technology piloting and microfiltration design were completed. 3. 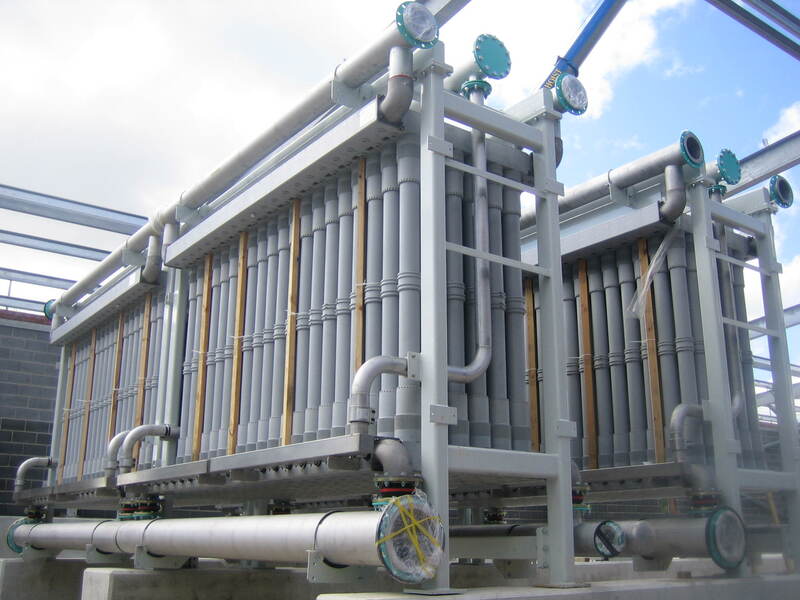 The performing contractor had to be a part of the design team so that proper constructability review could be executed to alleviate plant flow bypassing and to develop construction alternatives that would allow for raw water flows to be directed to the new microfiltration building with any remaining flows being conveyed to the adjacent conventional treatment plant. Project scope included expansion to an existing facility whereby the new expansion would be the base loaded treatment facility and the existing systems would be used for trim production demand as needed. To make these hydraulic improvements, Archer Western worked with Arcadis to collect as-built information to better predict new system integration so that plant outages could be minimized, and execution of system tie- ins were seamless. The design schedule to complete the expansion documents was beyond what the total project schedule could afford. Early in the design phase, Archer Western defined “packages” that would allow drawings and specifications to be completed, approved by permitting agencies, and competitively bid to prequalified contractors without schedule impact. This allowed Arcadis to focus on specific packages and not the entire expansion, saving time in design phase and kicking off construction activities a year in advance. Technology selection for the CAP WTP Expansion meant that the team performed bench and pilot testing to determine best application. Archer Western worked with system suppliers to set up side-by-side pilot testing stations to better evaluate performance compared to pricing of each microfiltration system and pretreatment technology. This approach helped achieve true transparency in the design and allowed for competitive pricing by participating manufacturers. This also allowed the specification to be specific to the chosen technology to keep design scope to a minimum. The collaborative-delivery application was proven through successful progression of the design without setback to the design team. Individual design packages allowed for City approval and early construction start dates to expedite the schedule and still meet budget goals. 8700 E Union Hills Dr.